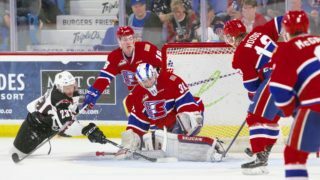 The Spokane Chiefs hold the 41st overall selection in the 2012 Canadian Hockey League Import Draft., which takes place on Wednesday June 27, 2012, beginning at 6:00 a.m. Pacific. The two-round draft will take place online with the order of selection rotating through each of the CHL’s three leagues using an inverse order of final regular season standings from the 2011-12 season. Each team in the CHL is permitted to carry two European import players each season who are selected annually through the CHL Import Draft. Teams are permitted to trade draft picks up to and during the CHL Import Draft process with the QMJHL’s Moncton Wildcats currently holding the number one pick acquired by trade with the Sherbrooke Phoenix. The WHL’s Prince Albert Raiders currently hold the second selection, followed by the OHL’s Erie Otters at number three. Last season the London Knights used the first overall pick to select defenceman Olli Maatta who was recently chosen 22nd overall by the Pittsburgh Penguins at the 2012 NHL Entry Draft. Maatta was one of four current CHL import players selected in the 2012 NHL Entry Draft headlined by Nail Yakupov who was selected first overall by the Edmonton Oilers after being the second overall selection of the Sarnia Sting in the 2010 CHL Import Draft. Mikhail Grigorenko of the Quebec Remparts was also selected in the first round at number 12 to the Buffalo Sabres, followed closely by Radek Faksa of the Kitchener Rangers who went at 13 to the Dallas Stars. Grigorenko was chosen second overall by the Remparts last season, with Faksa picked at number 22 by the Rangers the same season. The 2012 CHL Import Draft can be followed online as well as on tablet and mobile devices at www.chlimportdraft.com. 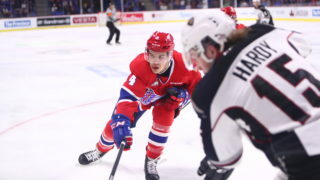 Kalus, a native of the Czech Republic, has appeared in 90 games over the past two seasons in Spokane, including 68 last season when he finished third on the club with 20 goals. Overall, he had 42 points. The 19-year-old to be was the 49th overall selection in 2010. Uher, the youngest player selected in the 2009 Import Draft, was recently signed to a three-year entry level contract by the Pittsburgh Penguins after finishing a three year Spokane Chiefs career. Uher totaled 143 points, including 58 goals, in 181 games in Spokane. Last season, Uher had 33 goals and 68 points in 63 games. Spokane took the forward from the Czech Republic with the 47th overall pick in 2009. In three seasons as a Chief, Ulmer played in 167 regular season games and another 40 during the playoffs. In 2010 Ulmer signed a professional contract with the Lugano Hockey Club in the Swiss National League where he has played the past two seasons. As a 17-year-old rookie he helped the Chiefs win the 2008 Memorial Cup. 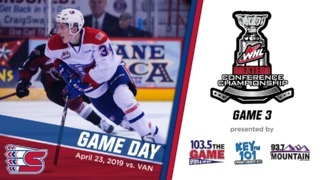 While in Spokane he twice played for Austria at world junior tournaments, winning the Best Defenseman award at the 2009 IIHF Group B World Junior Hockey Championship and appearing in the Group A tournament in 2010. Roman was the fifth overall selection in the draft and played 174 games in three seasons in Spokane, scoring 29 goals and 141 points. Roman led the Chiefs in scoring in the 2008 playoffs with nine goals and 21 points in 21 games. Roman was selected by the Dallas Stars in the fifth round of the 2007 NHL Entry Draft and has played in their system the past three seasons. Spokane selected Salmonsson, the Pittsburgh Penguins second round pick in 2004, with the 15th overall selection. Salmonsson scored 12 goals and 27 points in 54 games and played for Team Sweden at the World Junior Hockey Championships. Salmonsson spent just one season in Spokane and has played professionally in Europe for the past six seasons. Forward Michael Grabner was selected with the 22nd overall pick by the Chiefs in 2004 and became a first round NHL pick by the Vancouver Canucks in 2006 and was named a Calder Trophy Finalist in the NHL for the league’s top rookie in 2011 with the New York Islanders. Grabner scored 88 goals in three seasons, including 30 in back-to-back seasons. He made his NHL debut this season recording his first career goal on October 21st, 2009 and a hat-trick at Anaheim on April 2nd. With their first round pick, 20th overall, the Chiefs took Swedish defenseman Gustav Engman. In his two seasons in Spokane, Engman appeared in 126 games, including 68 in 2004-05. Stolc was selected with the 36th selection in the draft and appeared in 47 games in his one season in Spokane. Langhammer (50th overall) joined Stolc as a first round pick in the 2002 CHL Import Draft. In his rookie season of 2002-03, Langhammer scored 12 goals in 65 games and returned for a second season with 14 goals in 70 games. He has played the last seven seasons in his native Czech Republic. Gracia was the first ever Spaniard to be selected in the CHL Import Draft and play Major Junior Hockey in North America. In 17 games in 2001-02, Gracia scored three goals and four points. Lipka was the Chiefs lone selection in 2000 and registered four points in 35 games. Lipka was dealt in 2001 to the Prince Albert Raiders and scored 11 goals and 24 points in 67 games. Tvrdon averaged a point a game in his two-year career in Spokane totaling 54 goals, 78 assists and 132 points in 131 games. In 1999-2000, Tvrdon was the Chiefs co-Rookie of the Year and the WHL Western Conference Rookie of the Year. Tvrdon was a fifth round draft selection of the Washington Capitals. Bohac is the first Chief to lead the team in goals scored in back-to-back seasons. 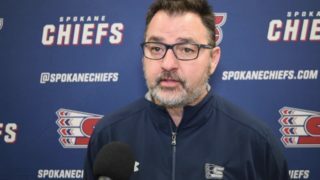 Bohac’s 39 goals in the 1999-2000 season led the Chiefs Western Conference Champions and he finished his two year career in Spokane with 65 goals and 119 points. He has played professionally between the United States and Czech Republic for 10 seasons. In two seasons, which included a franchise long nine game goal-scoring streak, Cisar tallied 64 goals and 139 points. Cisar was named the Chiefs Rookie of the Year in the 1996-97 season. Cisar, originally a second round pick of the LA Kings, became the first player under contract with Nashville and played 73 games in three seasons for the Predators. Cerven, the 19th overall pick in 1995, was traded during his rookie year to the Seattle Thunderbirds in favor of another import, Jan Hrdina. Cerven, a draft pick of the Philadelphia Flyers, scored 27 goals in the 1996-97 season for Seattle, while Hrdina registered 45 points in 36 games between the regular season and playoffs for Spokane. Pisa was the 13th overall selection in the 1994 Import Draft and scored one goal in 21 games during the 1994-95 season, a game winner. Leonov appeared in 170 games in his three-year career in Spokane and led the 1995-96 Chiefs in scoring with 38-57-95. That Chiefs team played in the WHL Finals after a 50 win regular season. 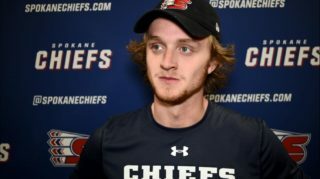 In just two seasons in Spokane, Bets registered back-to-back 100 point seasons and sits 17th on the Chiefs all-time scoring list. 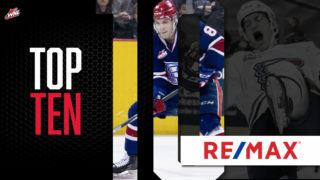 Bets holds the Chiefs rookie records for goals, assists and points. Notable- Valeri Bure was a list player for the Chiefs, joining Spokane in 1991-92, a year before the CHL Import Draft was instituted. Bure stands as one of the highest scoring Chiefs ever averaging 1.67 points per game in Spokane. Bure holds the Chiefs single season record for goals scored with 68 in 1992-93 and stands fourth on the Chiefs all-time scoring list with 135 goals, 163 assists and 298 points.